I am a researcher at Uppsala university, Sweden, where I work on devising novel sensing and communication mechanisms to enable sustainable networked embedded sensing systems. Over the past few years, I have been interested in developing networked embedded sensing systems that could function without batteries. Before graduate school, I received a Bachelors of Technology in Information and Communication Technology, and during my undergraudate studies, I worked on research projects related to wildlife tracking and seismic sensing using wireless sensor networks under Professor Prabhat Ranjan. I have received grant of (approx) 0.5 MSEK~(55k USD/ 50k EUR) from Vinnova to develop backscatter based battery-free sensors to enable future factories! Together with Professor Christian Rohner , we have received grant of (approx) 4 MSEK~(450k USD/ 400k EUR) from Vetenskapsradet to develop a wide-area network of battery-free backscatter sensors! Our work that proposes using LEDs to enable battery-free backscatter enabled backscatter devices has been accepted at ACM HotNets 2018 , Seattle, USA. I am serving on the TPC of ICDCS (IoT and CPS track) IEEE ICDCS 2019, Texas, USA. I am co-chairing the poster session at ACM/IEEE IPSN 2019 , Montreal, Canada. Please consider sending your exciting work in progress and get valuable early feedback! We received the best demonstration award at ACM WiSec 2018 , Stockholm for our work that presents our ongoing effort to design first battery-free radio tomographic imaging system. This work was done in collaboration between my student and Panos Papadimitrios (KTH) . I am a doctor, defended my Ph.D dissertation titled Enabling Sustainable Networked Embedded Systems . The grading committee consisted of Olga Saukh , Domenico Giustiniano , Andreas Kessler and opponent for the defence Prabal Dutta (UC Berkeley) ! Carlos presented our work "Battery-free 802.15.4 Receiver" at ACM/IEEE IPSN 2018. This works demonstrates ability to receive ZigBee transmissions while consuming an order of magnitude lower power compared to state-of-the-art radio transceievers. Here is the paper. Presented our work LoRea, that overturns the notion that backscatter is a short range communication mechanism at ACM SenSys 2017, Delft, Netherlands. LoRea achieves the highest demonstrated range of 3.4 km while consuming 70 microwatts at backscatter tag. Here is a photo of me presenting the work at the conference. Andreas, a student under my mentorship won the ACM Student Research Competetion (Graduate) @ ACM MobiCom 2017 for our work to design the first battery-free Visible Light Sensing System. Here is his submission work. We won the best paper award at ACM VLCS 2017 workshop which was co-located with ACM MobiCom 2017 for our efforts to design the first Battery-free visible light sensing system. The system can detect hand gestures and communicate them using RF-backscatter while consuming peak power of 20 microwatts! I take great pride in mentoring students, and am fortunate to be able to mentor the following students. Over the years, many of them have become friends and colleagues. Simon Olofsson , Research assistant, Uppsala University, "Convergecast using directional antennas"
Elena Di Lascio , Master thesis, Universita Degli Studi, Rome, Italy, "A Battery-free Indoor Localization System"
Oliver Harms, Master thesis, Uppsala University, "LoRea: A Backscatter reader for everyone!" Gustav Eriksson, Master thesis, Uppsala University, "Towards long-range backscatter communication using tunnel diode amplifiers"
Andreas Soleiman , Master thesis, Uppsala University, "Battery-free Visible Light Sensing"
Achievements during mentorship period: Winner ACM Student Research Competition held at ACM Mobicom 2017, Best paper at ACM VLCS 2017 (co-located with ACM MobiCom 2017), Best demonstration at ACM WiSec 2018, 1X Poster at ACM MobiCom 2017, 1X Demonstration at ACM WiSec 2018, 1X ACM VLCS 2017 research paper, selected for "The Cornell, Maryland, Max Planck Pre-doctoral Research School 2018"
We introduce BackVLC, a system to connect battery-free IoT tags using LED bulbs. We make use of bulbs beyond illumination. We send data to the tags with visible light communication (VLC), and retrofit the bulbs with simple circuitry to enable the uplink channel current VLC systems lack, using Radio Frequency (RF) backscatter communication from the tags. Tags process and send data, harvesting energy from light and radio. We present our system design and implementation, evaluate it in preliminary simulation studies and experiments, and discuss the research challenges to develop a complete network architecture. BackVLC is the first work that combines VLC with RF backscatter. Visible Light Communication (VLC) is emerging as a means to network computing devices that ameliorates many hurdles of radio-frequency (RF) communications, for example, the limited available spectrum. Enabling VLC in wearable computing, however, is challenging because mobility induces unpredictable drastic changes in light conditions, for example, due to reflective surfaces and obstacles casting shadows. We experimentally demonstrate that such changes are so extreme that no single design of a VLC receiver can provide efficient performance across the board. The diversity found in current wearable devices complicates matters. Based on these observations, we present three different designs of VLC receivers that i) are individually orders of magnitude more efficient than the state-of-the-art in a subset of the possible conditions, and i) can be combined in a single unit that dynamically switches to the best performing receiver based on the light conditions. Our evaluation indicates that dynamic switching incurs minimal overhead, that we can obtain throughput in the order of MBit/s, and at energy costs lower than many RF devices. 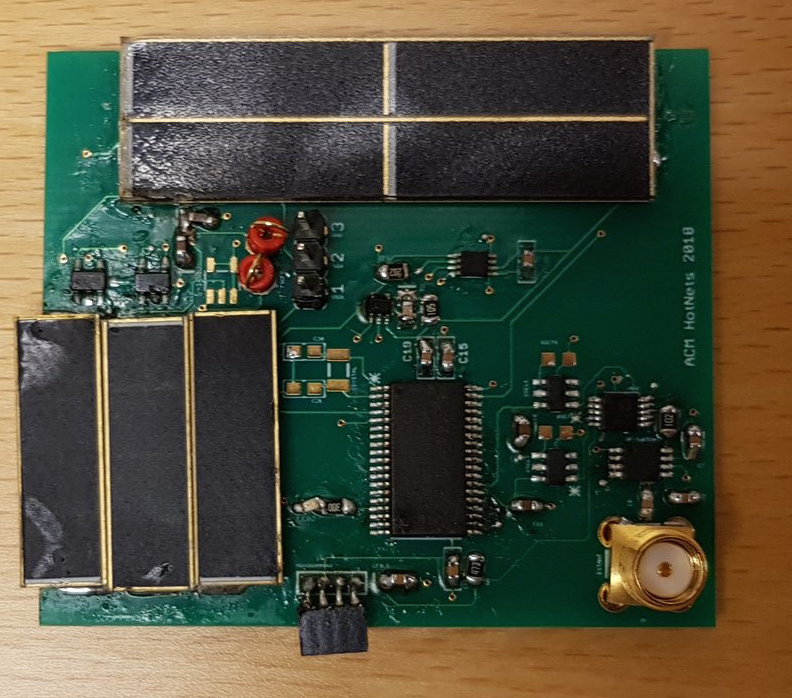 In this paper, We present the architecture of an 802.15.4 receiver that, for the first time, operates at a few hundred microwatts, enabling new battery free applications. To reach the required micro-power consumption, the architecture diverges from that of commodity receivers in two important ways. First, it offloads the power-hungry local oscillator to an external device, much like backscatter transmitters do. Second, we avoid the energy cost of demodulating a phase-modulated signal by treating 802.15.4 as a frequency-modulated one, which allows us to receive with a simple passive detector and an energy efficient thresholding circuit. We describe a prototype that can receive 802.15.4 frames with a power consumption of 361 Î¼W. There is the long-standing assumption that radio communication in the range of hundreds of meters needs to consume mWs of power at the transmitting device. In this paper, we demonstrate that this is not necessarily the case for some devices equipped with backscatter radios. We present LOREA an architecture consisting of a tag, a reader and multiple carrier generators that overcomes the power, cost and range limitations of existing systems such as Computational Radio Frequency Identification (CRFID). An off-the-shelf implementation of LOREA costs 70 USD, a drastic reduction in price considering commercial RFID readers cost 2000 USD. LOREA's range scales with the carrier strength, and proximity to the carrier source and achieves a maximum range of 3.4 km when the tag is located at 1 m distance from a 28 dBm carrier source while consuming 70 micro watt at the tag. When the tag is equidistant from the carrier source and the receiver, we can communicate upto 75 m, a significant improvement over existing RFID readers. We present the design of the first Visible Light Sensing (VLS) system that consumes only tens of Î¼Ws of power to sense and communicate. Unlike most existing VLS systems, we require no modification to the existing light infrastructure since we use unmodulated light as a sensing medium. 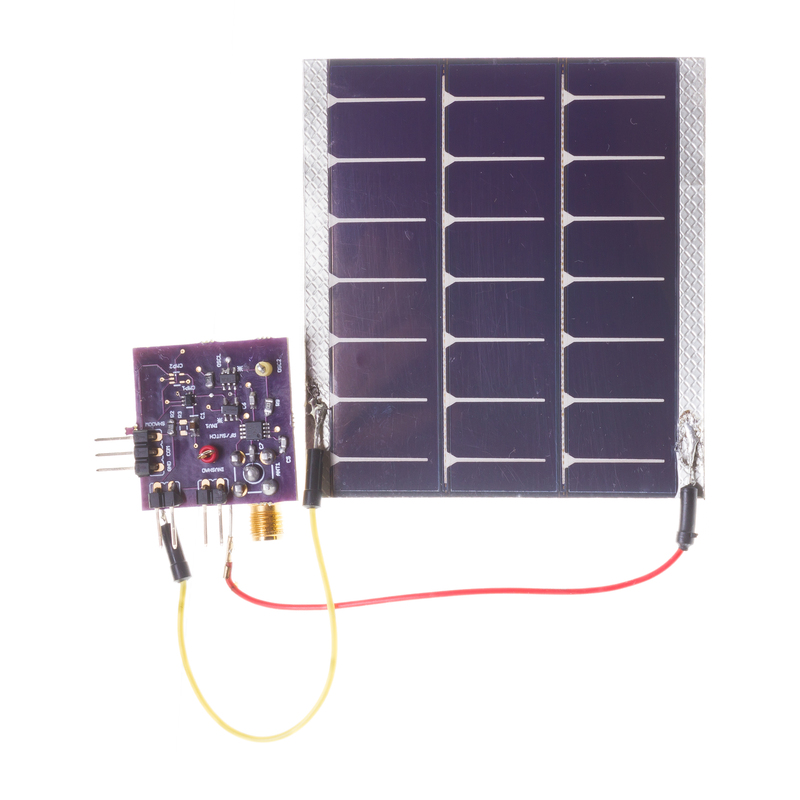 We achieve this by designing a novel mechanism that uses solar cells to achieve a sub- micro watt power consumption for sensing. Further, we devise an ultra-low power transmission mechanism that backscatters sensor readings and avoids the processing and computational overhead of existing sensor systems. Our initial results show the ability to detect and transmit hand gestures or presence of people up to distances of 330 m, at a peak power of 20 micro watts. Further, we demonstrate that our system can operate in diverse light conditions (100 lx to 80 klx) where existing VLS designs fail due to saturation of the transimpedance amplifier (TIA). Backscatter communication reflecting or absorbing ambient wireless signals enables transmissions at several orders of magnitude lower energy cost when compared to conventional low-power radios. The past few years have seen signficiant progress with systems demonstrating the ability to synthesise transmissions that are compatible with WiFi, ZigBee or BLE at micro watts of power consumption. However, these systems achieve a maximum communication range of tens of meters which severely limits the possible applications. On the other hand, our recent system LoRea demonstrates that backscatter communication can achieve a significantly longer range reaching upto a few kms when the tag is co-located with the carrier source. In our vision, such a large range could be a key enabler to develop wide-area networks of battery-free sensors. In this paper, we build on our system LoRea and identify issues of improving the reliability of weak backscatter links, increasing the range and supporting the operation of multiple tags as the key challenge to our vision, and present our preliminary efforts to address them. Due to several interesting properties such as large bandwidth and immunity against radio interference, Visible Light Com- munication (VLC) has caught the attention of the research community. Current efforts are, however, hampered by the lack of open source platforms. We present modBulb, an open, modular light bulb. modBulb is a VLC transmitter that can be customized to the applicationâ€™s requirements. modBulb enables modulation and other processing through an MCU for flexibility and ease of programming or an FPGA for applications that require higher efficiency. Furthermore, modBulb supports several driving circuits to balance the trade-off between energy efficiency and switching noise. Last but not least, the light source itself can be selected according to the applicationâ€™s requirements. We present experiments that demonstrate modBulbâ€™s salient properties. The sensing modalities available in an Internet-of-Things (IoT) network are usually fixed before deployment, when the operator selects a suitable IoT platform. Retrofitting a deployment with additional sensors can be cumbersome, because it requires either modifying the deployed hardware or adding new devices that then have to be maintained. In this paper, we present our vision and work towards passive sensor tags: battery-free devices that allow to augment existing IoT deployments with additional sensing capabilities without the need to modify the existing deployment. Our passive sensor tags use backscatter transmissions to communicate with the deployed network. Crucially, they do this in a way that is compatible with the deployed networkâ€™s radio protocol, and without the need for additional infrastructure. We present an FPGA-based prototype of a passive sensor tag that can communicate with unmodified 802.15.4 IoT devices. Our initial experiments with the prototype support the feasibility of our approach. We also lay out the next steps towards fully realizing the vision of passive sensor tags. We present DPT: a wireless sensor network protocol for bulk traffic that uniquely leverages electronically switchable directional (ESD) antennas. Bulk traffic is found in several scenarios and supporting protocols based on standard antenna technology abound. ESD antennas may improve performance in these scenarios; for example, by reducing chan- nel contention as the antenna can steer the radiated energy only towards the intended receivers, and by extending the communication range at no additional energy cost. The corresponding protocol support, however, is largely missing. DPT addresses precisely this issue. Our results, obtained in a real testbed using 802.15.4-compliant radios and custom ESD antennas we built, indicate that DPT ap- proaches the maximum throughput supported by the link layer, peaking at 214 kbit/s in the settings we test. Radio tomographic imaging (RTI) enables device free local- isation of people and objects in many challenging environ- ments and situations. Its basic principle is to detect the changes in the statistics of radio signals due to the radio link obstruction by people or objects. However, the local- isation accuracy of RTI suffers from complicated multipath propagation behaviours in radio links. We propose to use inexpensive and energy efficient electronically switched di- rectional (ESD) antennas to improve the quality of radio link behaviour observations, and therefore, the localisation accuracy of RTI. We implement a directional RTI (dRTI) system to understand how directional antennas can be used to improve RTI localisation accuracy. We also study the impact of the choice of antenna directions on the localisa- tion accuracy of dRTI and propose methods to effectively choose informative antenna directions to improve localisa- tion accuracy while reducing overhead. Furthermore, we analyse radio link obstruction performance in both theory and simulation, as well as false positives and false negatives of the obstruction measurements to show the superiority of the directional communication for RTI. We evaluate the per- formance of dRTI in diverse indoor environments and show that dRTI significantly outperforms the existing RTI locali- sation methods based on omni-directional antennas. A complete list of my publications can be found at this page . Top-tier ACM conferences and workshops in mobile computing, computer networking and networked embedded systems, i.e., SENSYS, IPSN, and HotNets, are highly selective venues selecting on an average one out of five submitted papers. Conferences are the primary source to dissementate scientific results in my area of research. These conferences are comparable or exceed many IEEE journals in their selectivity, visibility, and impact.